For any of you who are either native German speakers or at least have better German than I do. 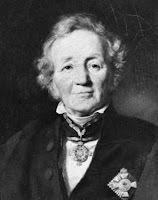 In last week's Higher there was a review by Richard Evans during which he referred to the famous quote by Leopold Von Ranke about history being about telling it 'wie es eigentlich gewesen': 'how it essentially was' (however you understand that 'eigentlich'). This is how the quote is frequently rendered (as throughout Fritz Stern's Varieties of History, etc.) and I can't imagine that Evans would get it wrong. What puzzles me, with my very imperfect German, is this. Shouldn't there be an auxiliary verb at the end? Shouldn't it be 'wie es eigentlich gewesen ist' ('how it essentially was') or 'wie es eigentlich gewesen war' ('how it essentially had been')? I don't have access to the German text, so I am wondering if any Germanophones can lay this to rest for me as it has bugged me for some time. I did once ask Walter Pohl who seemed to think that the phrase didn't make sense without an auxiliary. Am I missing something very obvious? It's a minor point but it has niggled me for some years. Thank you.